The Society of Friends of the Lethbridge Public Library exists to help our Library offer the best programs and services of any library in a community of comparable size in Canada. Volunteers are always needed to help with Friends' events. Please use the "contact us" button at the top of the website to make your interest in volunteering known to those who would welcome your help. The Friends 2019 Annual General Meeting will be held on November 4th. The Friends established the Booktique in the fall of 2006 with the "doors" opening in February of 2007. 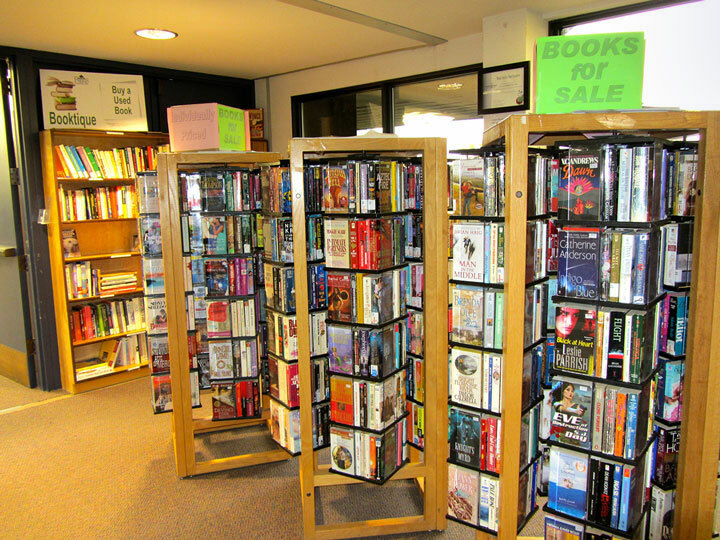 The Booktique comprises a number of shelves of books, CDs, and DVDs, providing a variety of items for sale every day that the Lethbridge Public Library (LPL) is open. At the Main Branch of the LPL, the Booktique is located on the bridge between the north and south wings of the Library. At the Crossings Branch, the Booktique is located adjacent to the internal door leading to the Friends' Room, near the washrooms. Hence, books, CDs, and DVDS can be purchased from either of the two Booktiques. Payment is made at the Customer Service Desks. For more information on donating books, CDs and DVDs , click here. Members of the Friends volunteer about 2000 hours annually! Your help would be most welcome. Please click the Volunteer Activities button below to learn more about our many activities. Money counts when it comes to fulfilling the objectives of the Friends organization. Please click the Donate Now button below to make your donation. Donations of books, CDs and DVDs can also be made in support of our activities. Click the button below to learn how and where. 2018-2019 Friends of Lethbridge Public Library Board of Directors: (seated L to R) Monica Ekvall, Sec. ; Isabelle Henderson, Pres. ; Karran Thorpe, Booktique Chair & Director; June Tagg, Vice-Pres. ; (Standing L to R) Caryl Nelson-Fitzpatrick, Treas. ; Vic Mensch, Director; Donna Seyed Mahmoud, Director; Wendy Kalkan, Library Bd. Liaison; Joanne Overn, Director; Missing: Margot Pollard, Past Pres. There are two types of membership in the Society of Friends: Voting Members and Associate Members. Membership status is based on donations of time and money. There are a couple of ways to become a Voting member in the Society. Individuals who donate $30 or more in a membership year (September 1 to August 31) are Voting members for that year. Alternately, an individual who donates 100 hours or more of volunteer time to Friends' activities in a previous membership year achieves Voting member status as well. Organizations who donate $50 or more may designate an individual to represent its Voting status. Associate members are those individuals who donate less than $30 or volunteer occasionally to support Friends' activities. These members are invited to General Meetings and their input and participation are welcomed. However, they may not vote on any motions or resolutions. Sales of donated books and DVDs are the largest source of annual income for the Friends. Casino revenue, every three years, is also a significant source of funds. Finally, cash donations are a regular and welcome revenue stream. As an all-volunteer organization, our costs always remain well below 1% of income. Please click the button below for more details. All members of the Friends act as informal ambassadors for our Library. The Friends organization supports the printing of the Library’s newsletter, “Happening”, and undertakes at least one advocacy activity each year. 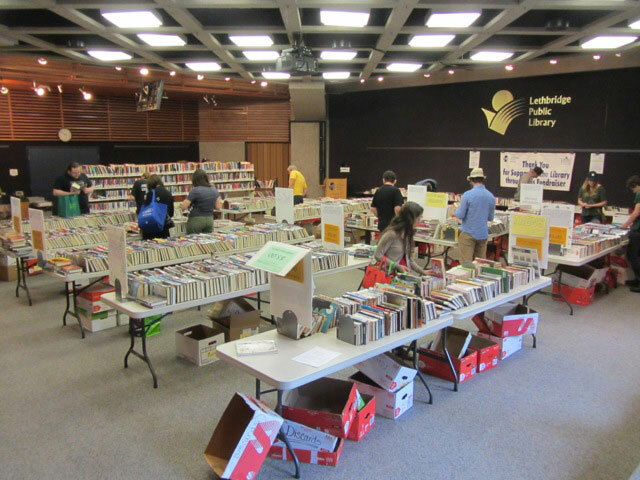 The Friends organization provides funding for extra services and needs or special programs of the Lethbridge Public Library, augmenting the funds provided by the City of Lethbridge, the largest funder of our Library.